Bees are dying at alarming rates, and scientists have identified a group of insecticides called neonicotinoids (“neonics”) as a prime culprit in these drastic population losses. 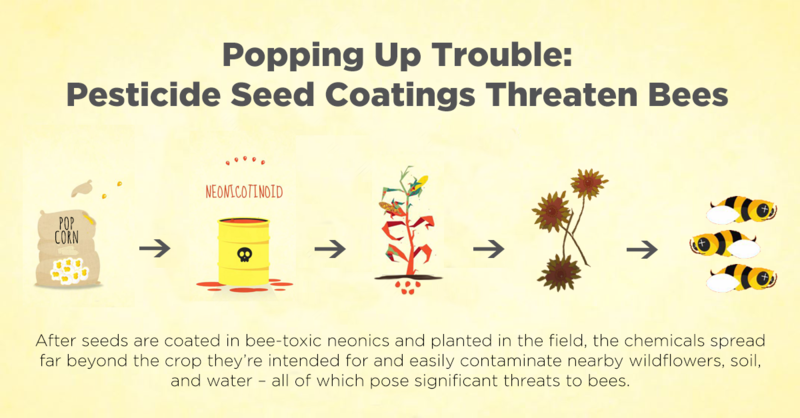 Neonic pesticides are used primarily as a seed coating—and America’s #1 popcorn brand, Orville Redenbacher, is serving us popcorn grown from these neonic-coated seeds. Sign the Petition! Tell Orville Redenbacher to Stop Killing Bees! It’s no secret we love popcorn: Americans consume more than 16 billion quarts of popcorn each year.But we’re getting more than we bargained for in all those bowls of popcorn: bee-toxic pesticides called neonicotinoids, or “neonics.” There are roughly 40 insecticides currently registered for use as an active chemical on popcorn,including 3 bee-toxic neonic chemicals: clothianidin, thiamethoxam, and imidacloprid.1 Between 79 and 100 percent of corn seed in the U.S. is coated with neonics, and popcorn is no exception. Popcorn ranks high on the list of snack favorites. Want to join us in standing up for bees? Use your purchasing power to support popcorn companies that are doing the right thing for bees and the environment.,Our Guide to Bee-Friendly Popcorn can help you get started!